When we were eating at Japanese buffet place in Houston the other day I said, “Koph khun ka!” (Thank you!) to the server after she gave us our drinks. I don’t think she really heard me, thankfully, but Dom’s mom, sister (who are visiting with us for three weeks from Thailand) and Dom all chuckled at me. 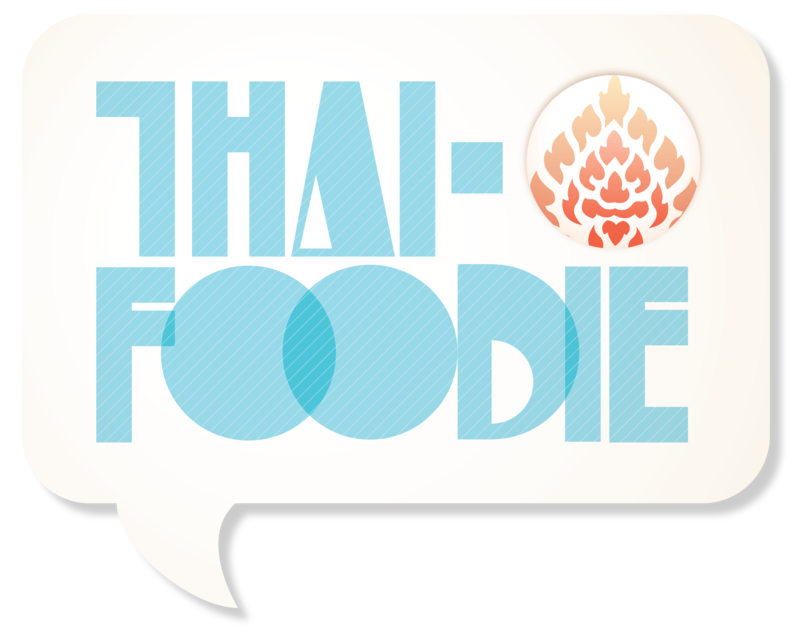 My body might be back in America, but a part of my heart, mind and taste-buds are still in Thai mode, and always will be. The main focus of our itinerary, after figuring out which Thai friends or family we would meet up with on which day, was what we would eat with them. During our trip, we went to a food stall at the beach in Krabi, saw the crab and fish that was just caught that morning swimming in a tank as we walked in. 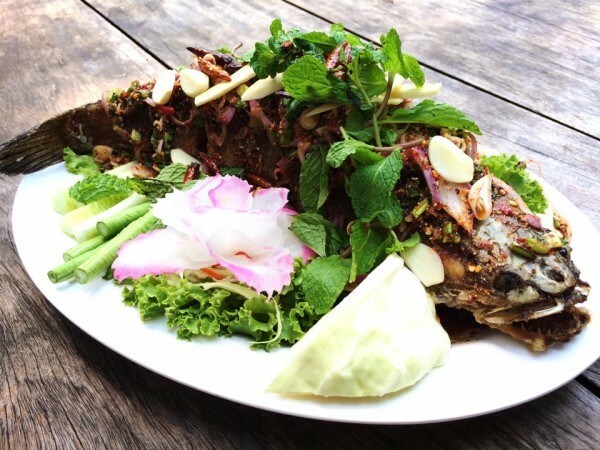 Then we watched it get plucked out and turned into Thai Crab Curry and Fried Fish with Lemongrass, Mint and Garlic Chili Sauce, which was delicately place on our wooden, ocean breeze worn table. 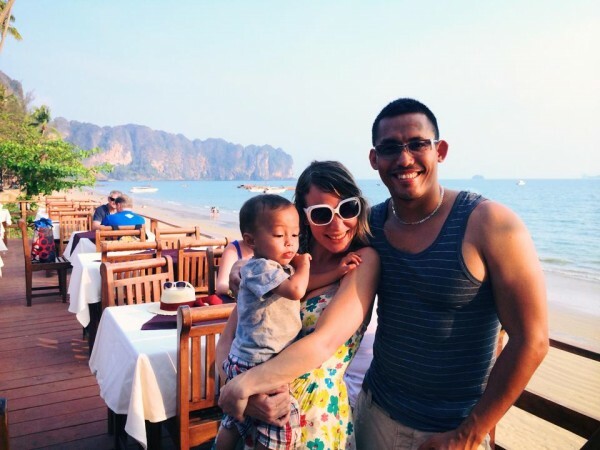 I loved eating every bite while seeping our toes in the white sand, and gazing at the sunset over the emerald green Thai waters. Priceless. For both my pregnancies, I’ve always craved fresh, cold fruit. 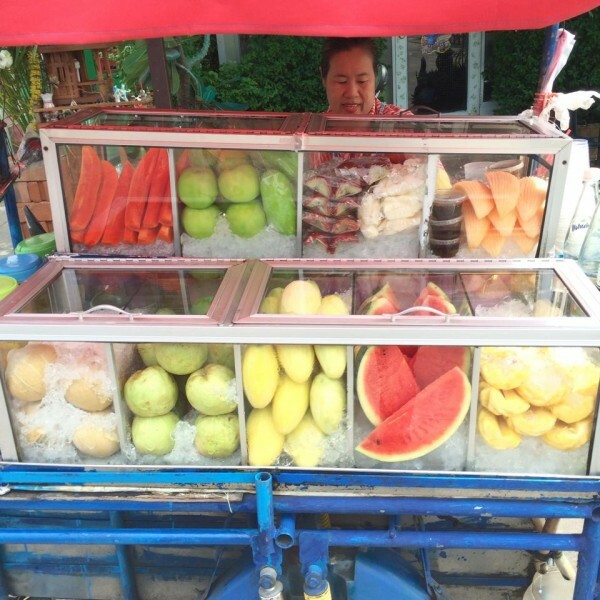 I think it might’ve been the 110 degree heat during our trip, but the moment we stepped out our condo’s door every day, my eyes scoured the street for fruit vendors selling pineapple, papaya, rose apples, unripe mango and guava, complete with a bamboo stick to poke the fruit in a spicy dipping sugar. 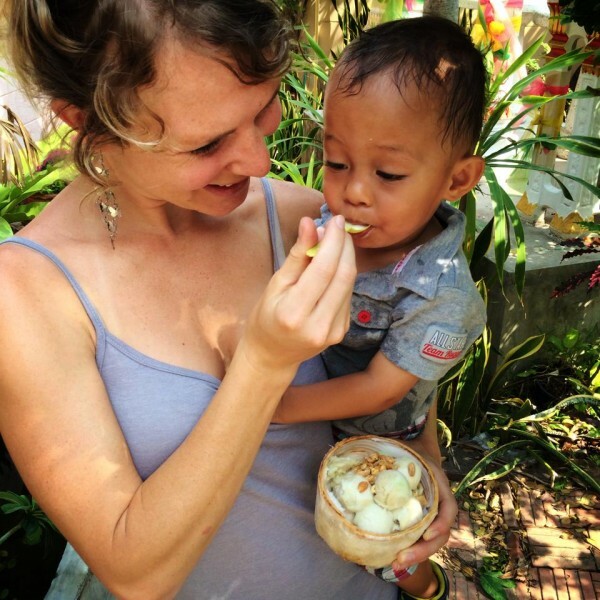 A bag of fresh, cold chopped fruit is only 20 baht, which is less than a dollar, and makes any pregnant mama cool and happy for at least 20 minutes. During our three week visit to Thailand, we rode in a car, bus or van from Bangkok to Krabi to Bangkok to Sukhothai to Phitsanuluk to Bangkok to Chonburi to Bangkok. I didn’t mind all the road trips though because of the pit stops for Thai food. As we drove, after every certain amount of kilometers what I like to call a Thai oasis appeared. They always had a gas station, and a little strip of small restaurants or street vendor-ish stalls where you can get Thai snacks like Lays chips flavored like Larb, or pork meatballs steaming in a bag with gooey sweet, spicy sauce, or fresh coconut ice cream scooped into a coconut shell, or Thai iced coffee to keep you going, or krapaw gai made quickly, so you can eat fast and get back on the road. My favorite vendor at Thai pit stops is Five Star Chicken, which sells amazing fried chicken, sticky rice, with a special sauce and other random delights like fried gyoza, chicken ham, fish stars and chicken karage. I’ll never forget each bite I had in the car on the way to Krabi while gazing at the rubber trees and blue sky flying by our window. Our last lunch in Bangkok was spent on the sidewalk of the soi near our condo, eating Rad Na Moo, Krapaw Moo and Pad See Ew. I let every bite mingle in my mouth for awhile since I wanted it to last forever. The street food vendor we got it from was so popular we had to wait quite awhile for our food, but it was so worth it. I loved gazing at her cooking poweress as she chopped, stirred and ladled in her sidewalk kitchen as smoothly as a chef at a high-end restaurant. How I hope I can cook as confidently and quickly as her one day! Dom and I couldn’t wait to get to his hometown of Sukhothai in northern Thailand. Of course we wanted to see his grandma and dad, but another huge reason was to eat the food in Sukhothai. 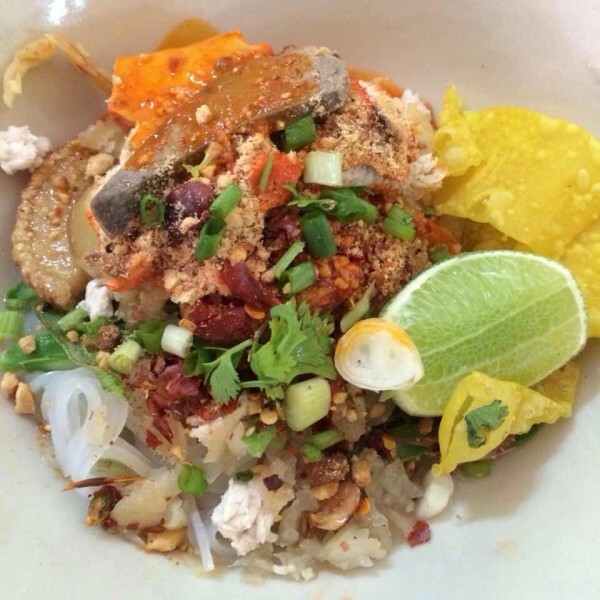 Like in America, each region in Thailand has its own specialities that you can get other places in Thailand, but just taste better in the land where they began. As we sat at the Sukhothai noodle soup vendor where Dom went since he was a kid, I loved watching little Rocco play with a friendly dog laying nearby under a tree, and wondering if Dom had done the same with another dog by that same tree when he was Rocco’s age. The Sukhothai noodle soup there used to be 7 baht when Dom was a kid, when I first visited five years it was 25 baht, but now the menu board had scratched off that price and wrote in 35 baht above it. But it’s definitely worth way more than a $1 in our eyes. And I got to eat Sukhothai Pad Thai three different times, it was heavenly, and just not the same as eating it at our table in Austin. I miss so much more, but those are only some of the types of Thai food tingling on my pregnant craving tongue at the moment. And there are so many more stories and lessons from our trip to come! Thank you for being patient with me in my lack of posts as we slowly adjust back to reality! Asking what people ate on their overseas trips are my favorite thing. Thanks for sharing! It sounds so incredible! 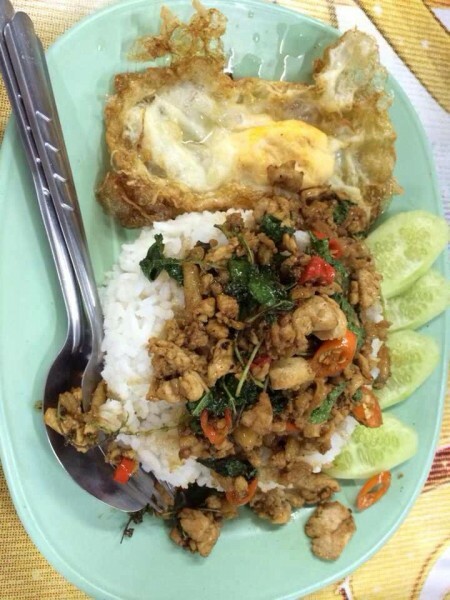 I went to Chiang Mai for a week on 26 December 2013 and tried lots of northern Thai dishes. One of the ones that stood out for me was Nam Prik Noom. I went on a motorbike tour and we visited a Karen village and had lunch with them. The tour guide is friends with them. We also had pork crackling, sticky rice and roasted chicken. My guide bought lunch at a market on the way to the village which was an hours ride from the market. At first I had no idea what it was and I thought, well, when in Rome. So I gave it a go and was glad I did. I like to try everything once. Well almost everything. I visited Pattaya for two weeks for the first time on 31 March 2014 and on my first night they had a market set up on beach road. I found a stall that was selling freshly made Nam Prik Noom, pork crackling and sticky rice. I had to have that for dinner that night and took my purchase (in plastic bags) to a bar, so I could sit down to eat. The women in the bar looked at what I had and said, you eat like Thai people.